If you're a fan of comfort dressing when it comes to your personal style, you'll love this totally chic pairing of a Reclaimed Vintage revived cropped camo jacket with faces print and a white and black horizontal striped casual dress. Up the cool of your getup by wearing beige suede heeled sandals. If you're all about relaxed dressing when it comes to fashion, you'll love this totally chic pairing of a Reclaimed Vintage revived cropped camo jacket with faces print and black ripped skinny jeans. You could perhaps get a little creative in the shoe department and lift up your getup with black leather heeled sandals. We're all seeking comfort when it comes to dressing up, and this combination of a Reclaimed Vintage revived cropped camo jacket with faces print and a black skater skirt is a vivid example of that. Sporting a pair of black leather ankle boots is an easy way to add extra flair to your ensemble. Pair a Reclaimed Vintage revived cropped camo jacket with faces print with a black leather mini skirt for comfort dressing from head to toe. Team a Reclaimed Vintage revived cropped camo jacket with faces print from Asos with black skinny jeans, if you feel like relaxed dressing without looking like a slob. You could perhaps get a little creative when it comes to footwear and lift up your outfit with brown suede ankle boots. 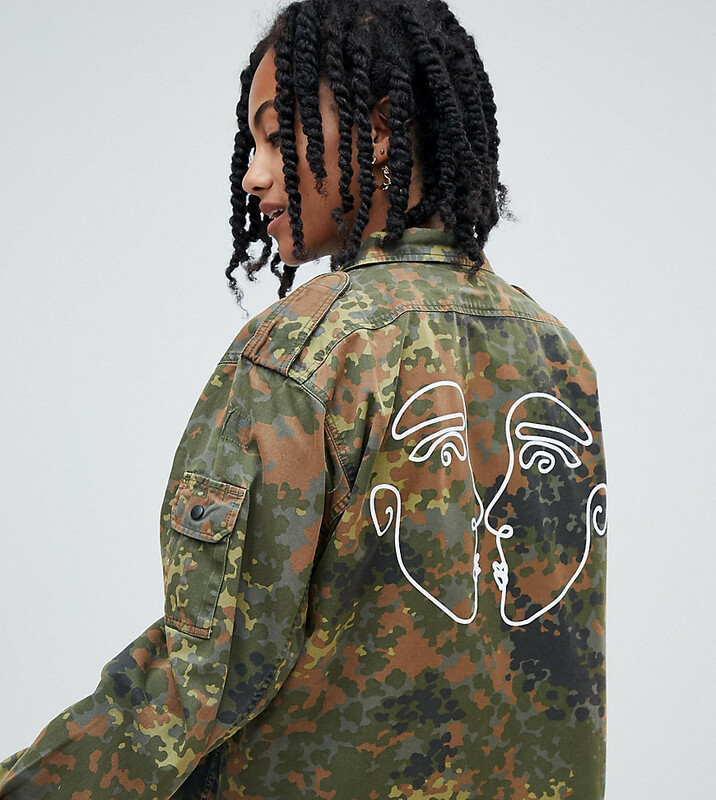 If you're all about feeling relaxed when it comes to fashion, this combination of a Reclaimed Vintage revived cropped camo jacket with faces print and blue ripped boyfriend jeans is just for you. If you're all about comfort dressing when it comes to your personal style, you'll love this adorable pairing of a Reclaimed Vintage revived cropped camo jacket with faces print and blue denim shorts. To bring out a sassier side of you, finish off your look with gold leather flat sandals. If you're all about relaxed dressing when it comes to your personal style, you'll love this totally stylish combination of an olive camouflage military jacket and blue skinny jeans. 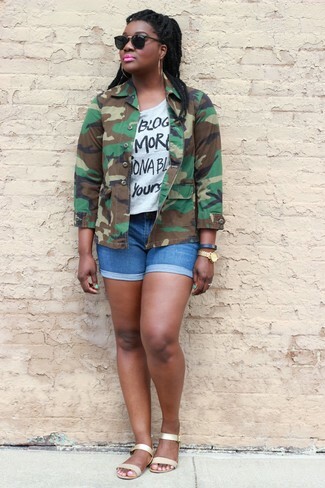 Finish off this ensemble with olive leather wedge sneakers. If you're obsessed with functionality dressing when it comes to your personal style, you'll love this totally chic pairing of a Reclaimed Vintage revived cropped camo jacket with faces print and black skinny jeans. For something more on the daring side to complement this outfit, grab a pair of grey athletic shoes.